The Crystal of the Day Sunday 17 November 2013 is Apache Tears. The Legend of the Apache Tear is this: One day a party of Apache Indians were ambushed by an enemy tribe. The Apaches fought bravely but were greatly outnumbered and driven to the top of a high bluff. Their arrows gone and unable to fight and unwilling to be taken captive, they leapt from the cliffs to their death. Their women were understandably grief-stricken and wept over the bodies. Their teardrops froze when they hit the ground to become the lovely stones we know today as Apache Tears. It is said that whomever owns one of these stones will never cry again, for the Apache women shed enough tears already. Apache Tears are said to especially relieve grief and sadness as well as assisting in giving and accepting forgiveness. They can help release negative emotions, and they also can balance one’s emotional state. They are good luck stones, said to bring good luck to anyone who has one. They are excellent meditation tools, especially for clarifying issues and gaining insight. Apache Tears are a gently grounding stone. In the physical realm, Apache Tears are reputed to alleviate muscle spasms and eliminate toxins from the body. 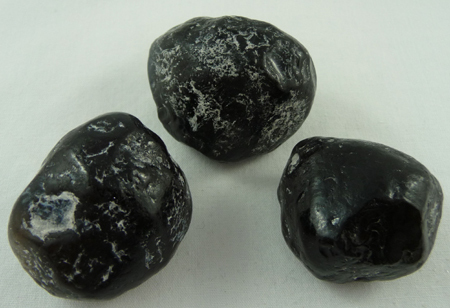 Apache Tears are a type of black Obsidian, but they have a more friendly vibration than some of the other types of Obsidian. Perhaps it is their strange out-of-shape appearance that makes you comfortable with them. These are very useful stones for anyone to use, but if you are a healer, or if you are doing any spiritual development work, there are strong advantages to using these stones. Their energy works within the base chakra where it will move excess energy down into the earth chakra for grounding with Mother Gaia. The energy of the Apache Tears will strengthen the blood and the immune system and they will help the body to assimilate Vitamin C and D. They assist with the reduction of toxins in the body by aiding their removal. They may calm muscle spasms and enhance vitality and strength within the body. Their energy within the sacral chakra helps to aid the removal of disharmonious energies in relationships. Within the heart chakra their energy will assist the emotional body to heal… from old issues of an emotional nature. They may bring through joy as they encourage you to feel more positive about life. Because they do absorb so much negativity, they will need to be regularly cleansed using one of the methods for cleansing crystals. The Crystal of the Day for Wednesday 18 September 2013 is Dravite (Brown Tourmaline). 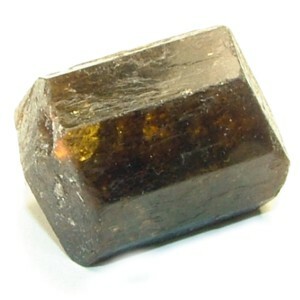 Dravite is a brown variety of tourmaline. It is an ideal stone for self-healing, aids in finding emotional strength and self-acceptance. Dravite inspires courage and persistence. It calms and soothes, grounding and stabilising the inner self. Dravite helps you to come down from the higher planes and to make a stronger earth connection. This crystal is deeply cleansing energetically and helps to grant you added stamina when you are going through onerous situations. It helps you to have a deeper acceptance of yourself, especially those parts of yourself that you may not like and would rather did not exist. With acceptance comes the ability to move on with life. Many of us may feel that it is exciting to work with stones that take you to the higher realms. This is easy to understand, as it is not only very interesting but it also brings spiritual growth, and often growth of psychic abilities. But if you work only in the higher realms, problems may be ignored… only to come out unexpectedly and be in your face because they have not been dealt with. If you have found that your emotions sometimes get out of control over nothing, look at what the ‘nothing’ was. It may relate to an old issue you have not dealt with. This stone is good to help you to pull out those old issues and look at them, and accept the part of yourself, or the way that you have handled a situation in the past, that you have been trying to ignore. This deep brown crystal is particularly helpful if you have been working a lot with high vibration stones, and especially if you have not been taking action to ground yourself fully afterwards. It is a strong spiritual grounding stone that works to help you to connect more easily and more deeply to the earth chakra and to the energy of Mother Gaia. Dravite Tourmaline is deeply cleansing energetically and helps to give you added stamina when you are going through difficult situations. This crystal helps to inspire courage and persistence to keep going when you would rather give up. It has a calming and soothing action that assists you to feel more loving towards yourself. Its energy within the heart chakra helps you to relax and let go. The vibration of this deep brown crystal aids you to release negative energy, while it fills your auric field with high vibration loving energy. If you allow this loving energy to resonate within you, it will help you to accept that all of you is perfect, even the parts of yourself that you may find unacceptable or unlovable. It assists you to feel compassion for all aspects of who you are and brings a gentle and soothing healing of your emotional body.